How Does World History Fit into the Biblical History? Question: I’m curious to know what other civilations were doing during the time of Genesis and Exodus. We know something about the Romans and the Near East, but what about European countries etc. I have a difficult time following the tie between the ancestors of the children of Noah and the gentiles who populated the rest of the world. Answer: I found this site online: http://agards-bible-timeline.com/bible_timeline_online_30BC.html. There is a link at the top of each segment of the timeline that allows you to forward or backward in time. Check it out. Was Matthew 24 Fulfilled at the Destruction of Jerusalem in A.D. 70? Question: I had an interesting conversation with someone last week who said this passage in Matthew 24 was about the fall of Jerusalem not the rapture or end times. What do you think? 1 Jesus left the temple and was walking away when his disciples came up to him to call his attention to its buildings. 2 “Do you see all these things?” he asked. “I tell you the truth, not one stone here will be left on another; every one will be thrown down.” 3 As Jesus was sitting on the Mount of Olives, the disciples came to him privately. “Tell us,” they said, “when will this happen, and what will be the sign of your coming and of the end of the age?” 4 Jesus answered: “Watch out that no one deceives you. 5 For many will come in my name, claiming, ‘I am the Christ, and will deceive many. 6 You will hear of wars and rumors of wars, but see to it that you are not alarmed. Such things must happen, but the end is still to come. 7 Nation will rise against nation, and kingdom against kingdom. There will be famines and earthquakes in various places. 8 All these are the beginning of birth pains. 9 Then you will be handed over to be persecuted and put to death, and you will be hated by all nations because of me. 10 At that time many will turn away from the faith and will betray and hate each other, 11 and many false prophets will appear and deceive many people. 12 Because of the increase of wickedness, the love of most will grow cold, 13 but he who stands firm to the end will be saved. 14 And this gospel of the kingdom will be preached in the whole world as a testimony to all nations, and then the end will come. 15 So when you see standing in the holy place ‘the abomination that causes desolation,’ spoken of through the prophet Daniel–let the reader understand– 16 then let those who are in Judea flee to the mountains. 17 Let no one on the roof of his house go down to take anything out of the house. 18 Let no one in the field go back to get his cloak. 19 How dreadful it will be in those days for pregnant women and nursing mothers! 20 Pray that your flight will not take place in winter or on the Sabbath. 21 For then there will be great distress, unequaled from the beginning of the world until now–and never to be equaled again. 22 If those days had not been cut short, no one would survive, but for the sake of the elect those days will be shortened. 23 At that time if anyone says to you, ‘Look, here is the Christ!’ or, ‘There he is!’ do not believe it. 24 For false Christs and false prophets will appear and perform great signs and miracles to deceive even the elect–if that were possible. 25 See, I have told you ahead of time. 26 So if anyone tells you, ‘There he is, out in the desert,’ do not go out; or, ‘Here he is, in the inner rooms,’ do not believe it. 27 For as lightning that comes from the east is visible even in the west, so will be the coming of the Son of Man. 28 Wherever there is a carcass, there the vultures will gather. 29 Immediately after the distress of those days ‘the sun will be darkened, and the moon will not give its light; the stars will fall from the sky, and the heavenly bodies will be shaken.’ 30 At that time the sign of the Son of Man will appear in the sky, and all the nations of the earth will mourn. They will see the Son of Man coming on the clouds of the sky, with power and great glory. 31 And he will send his angels with a loud trumpet call, and they will gather his elect from the four winds, from one end of the heavens to the other. 32 Now learn this lesson from the fig tree: As soon as its twigs get tender and its leaves come out, you know that summer is near. 33 Even so, when you see all these things, you know that itd is near, right at the door. 34 I tell you the truth, this generatione will certainly not pass away until all these things have happened. 35 Heaven and earth will pass away, but my words will never pass away. Answer: It is a common hallmark of Biblical prophecy that there is an ultimate fulfillment of kingdom prophecies that nevertheless have multiple in-between fulfillments that are less than the ultimate fulfillment. For example, God told the serpent that He would put enmity between the serpent and the woman and between her seed and his seed, and that the serpent would bruise the seed of the woman’s heel but the seed of the woman would bruise the serpent’s head (Genesis 3:15). We are almost immediately given an example of that in Cain’s murder of his brother Abel. The apostle John, writing about this many centuries later, says Cain “belonged to the evil one” (1 John 3:12), an apparent reference to his being the seed of the serpent. Many other attempts are made by the serpent (Satan) to destroy the godly seed (Joseph’s brothers selling him into captivity, Pharoah trying to have all boys born to Israelites killed, Baalam’s attempt to curse Israel, etc.) but in each case the godly seed survives and gains a victory over the ungodly. However, the ultimate fulfillment of this prophecy is found in Jesus, whom Satan manages to kill but whom God resurrects and who will come eventually to destroy Satan and all those who follow him. In the same way, this prophecy in Matthew 24 has a near fulfillment and even some subsequent fulfillments (the attempted extermination of Jews in Nazi Germany), but the ultimate fulfillment is still waiting. Yes, many of the features of the Roman destruction of Jerusalem in A.D. 70 fit Jesus’ description, but many do not. Most obviously is the fact that Jesus did not come back in the clouds in a way that is obvious to all. We are still looking for this coming so we should still expect these predictions to be fulfilled in the most literal and complete way. Question: I keep hearing that the Bible references Islam before it split from Judaism in the Old Testament. Is that for real, and, where can I find it? It seems like there’s a chance to heal that breach, and the answer is in the Bible somewhere. Just like witnessing to Jews, only more difficult. Answer: Islam did not start until roughly 600 A.D. You’re probably thinking about how Ishmael and Isaac were separated in a sense as they each fathered separate nations. 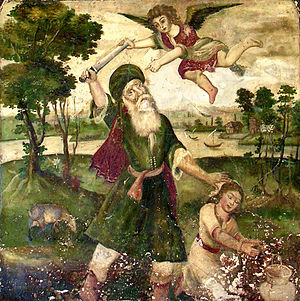 Ishmael was removed from Abraham’s family when Isaac was identified as the child of promise from God to Abraham and Sarah. Muslims argue that Ishmael was the favored child and meant for the greater destiny, i.e., Islam. In fact, they teach that it was Ishmael and not Isaac who was offered as a sacrifice before God provided a substitute animal. But check out Genesis 21 and 22. What is the difference between Roman Catholicism and what Central Church teaches? Question: : What is the difference between Roman Catholicism and what Central Church teaches? AUTHORITY: Protestants (Central Church is a Protestant church) do not accept that the Pope, the bishop of Rome, is the final authority for the church, nor is he infallible when he speaks from his position of authority. His word holds no more authority than any other man of spiritual accomplishment. We may appreciate his wisdom, but do not take it as law. We also respect the traditions and councils of the past, but we do not see them as binding. Only the Bible can be the arbiter for our decisions about what God wants us to be and do as His Church. We also do not believe that you have to be a member of the Catholic Church to be in God’s family (http://www.catholic.com/thisrock/1999/9909frs.asp). Faith in Christ transcends denominations. To be fair, there are some Protestants who in essence believe that if you are not a part of their denomination you are likely not saved, but this is wrong. SCRIPTURE: Protestants are encouraged to read and study the Bible, whereas, at least in the past, Catholics were not. There are variations of interpretation of the Bible within Catholicism, but not anything like among Protestants. 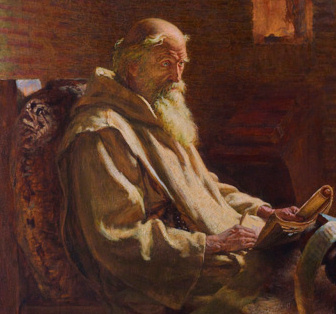 However, it is Protestants who have furthered the progress of Bible interpretation far beyond the Catholic scholarship, though Catholics have made significant contributions. But this is because Protestants see the Bible as available to everyone and the only authority by which we discern God’s will. There is also a difference in the amount of value placed on the Apocrypha, a group of books written after Malachi and before the New Testament that Catholics include in their Bibles. Catholics give much more authority to these books than do Protestants, as evidenced by the fact that few Protestant Bibles even include them. 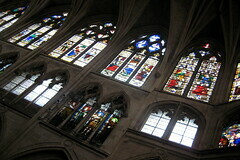 SACRAMENTS: Protestants, Central Church included, only believe in two rites of salvation, baptism and the Lord’s supper. Baptism, Confirmation or Chrismation, the Eucharist (Lord’s Supper), Penance (confession to an ordained priest and assigned acts of contrition), Anointing of the Sick, Holy Orders (ordination of bishops, priests and deacons), and Matrimony make up the seven sacraments for Catholics, who define these as “efficacious signs of grace perceptible to the senses” through which “divine life is bestowed” and which are “necessary means of salvation for the faithful” (Wikipedia, Sacraments of the Catholic Church). Protestants do not, for the most part, believe that baptism or the Lord’s Supper are necessary means of salvation, but do see them as essential to the blessing of our lives and encouragement to spiritual growth once we are saved. Protestants also do not see the elements of the Lord’s Supper, the bread and the wine, as in any way actually becoming the physical body and blood of Christ. Lutherans believe that the physical body and blood of Christ surround the elements during the Lord’s Supper, but other Protestants, including Central Church, believe the elements symbolize the body of Christ and that he is present in a spiritual sense only when we partake of the supper in faith. PRAYER AND CONFESSION: We do not practice praying to the saints who have gone before us. In the Catholic confession, though all believers may be called “saints” in a general sense, there are those who have elevated themselves by exemplary lives and performance of miracles who have then been enshrined by the church as official Saints of the church. These people are often called upon in prayer, particularly Mary, the mother of Jesus, to bring their requests to the Lord Himself. It is assumed that they have the ear of God in a way we might not and can aid us in getting our requests answered. At Central Church we believe that we have just as much access and just as much the ear of God as any other believer because we come through the merit of Christ. We do ask others to pray for us, and may feel they have a better chance of being heard than we do, but this is essentially wrong. There is value in having many pray, not because God will be more persuaded to respond, but because it is a way of showing our love for one another. At Central we encourage confessing our sins in situations with other believers where a bond of trust has been established and an accountability can be maintained. There is no need to go to an ordained individual for this purpose, though there is no discouragement from doing so. LEADERSHIP: Though we ordain men to the ministry and assign them responsibilities to lead God’s flock, we also believe that every believer is a priest before God, with full access to Him and full rights to exercise decisions of conscience. We will seek advice and direction from leaders, but do not see leaders as exercising authority more potent than their example. Believers are told to obey their leaders (Hebrews 13:17) but leaders are encouraged not to “lord it over” the flock (1 Peter 5:3). For further study from one facet of the Catholic Church about their distinctive beliefs visit http://www.catholic.com/default.asp. How did we get our Bible with 66 books? Question: How were all the books in the Bible collected to make the Bible? Who decided which books would make up the Bible and how did they decide which ones to include? Answer: I found this site (bible-researcher.com) to be quite acceptable as an explanation of the development of what we call the canon of Scripture. There may be more than you want to read here, but I would suggest that you at least read the Introduction to the Canon and Ancient Versions article. There are a number of helpful charts. There is an article further down by F. F. Bruce, who is considered a giant in New Testament studies. Where did we get the name “Easter”? Question: Where did we get the word “Easter”? An alternative explanation has been suggested. The name given by the Frankish church to Jesus’ resurrection festival included the Latin word “alba” which means “white.” (This was a reference to the white robes that were worn during the festival.) “Alba” also has a second meaning: “sunrise.” When the name of the festival was translated into German, the “sunrise” meaning was selected in error. This became “ostern” in German. Ostern has been proposed as the origin of the word “Easter”. Many, perhaps most, Pagan religions in the Mediterranean area had a major seasonal day of religious celebration at or following the Spring Equinox. Cybele, the Phrygian fertility goddess, had a fictional consort who was believed to have been born via a virgin birth. He was Attis, who was believed to have died and been resurrected each year during the period MAR-22 to MAR-25. “About 200 B.C. mystery cults began to appear in Rome just as they had earlier in Greece. Most notable was the Cybele cult centered on Vatican hill …Associated with the Cybele cult was that of her lover, Attis (the older Tammuz, Osiris, Dionysus, or Orpheus under a new name). He was a god of ever-reviving vegetation. Born of a virgin, he died and was reborn annually. The festival began as a day of blood on Black Friday and culminated after three days in a day of rejoicing over the resurrection.” Wherever Christian worship of Jesus and Pagan worship of Attis were active in the same geographical area in ancient times, Christians “used to celebrate the death and resurrection of Jesus on the same date; and pagans and Christians used to quarrel bitterly about which of their gods was the true prototype and which the imitation.” Many religious historians believe that the death and resurrection legends were first associated with Attis, many centuries before the birth of Jesus. They were simply grafted onto stories of Jesus’ life in order to make Christian theology more acceptable to Pagans. Others suggest that many of the events in Jesus’ life that were recorded in the gospels were lifted from the life of Krishna, the second person of the Hindu Trinity. Ancient Christians had an alternative explanation; they claimed that Satan had created counterfeit deities in advance of the coming of Christ in order to confuse humanity. Modern-day Christians generally regard the Attis legend as being a Pagan myth of little value. They regard Jesus’ death and resurrection account as being true, and unrelated to the earlier tradition. Wiccans and other modern-day Neopagans continue to celebrate the Spring Equinox as one of their 8 yearly Sabbats (holy days of celebration). Near the Mediterranean, this is a time of sprouting of the summer’s crop; farther north, it is the time for seeding. Their rituals at the Spring Equinox are related primarily to the fertility of the crops and to the balance of the day and night times. Where Wiccans can safely celebrate the Sabbat out of doors without threat of religious persecution, they often incorporate a bonfire into their rituals, jumping over the dying embers is believed to assure fertility of people and crops. According to the Venerable Bede, Easter derives its name from Eostre, an Anglo-Saxon goddess of spring. A month corresponding to April had been named “Eostremonat,” or Eostre’s month, leading to “Easter” becoming applied to the Christian holiday that usually took place within it. Prior to that, the holiday had been called Pasch (Passover), which remains its name in most non-English languages. (Based on the similarity of their names, some connect Eostre with Ishtar, the Babylonian and Assyrian goddess of love and fertility, but there is no solid evidence for this.) It seems probable that around the second century A.D., Christian missionaries seeking to convert the tribes of northern Europe noticed that the Christian holiday commemorating the resurrection of Jesus roughly coincided with the Teutonic springtime celebrations, which emphasized the triumph of life over death. Christian Easter gradually absorbed the traditional symbols. In Medieval Europe, eggs were forbidden during Lent. Eggs laid during that time were often boiled or otherwise preserved. Eggs were thus a mainstay of Easter meals, and a prized Easter gift for children and servants. In addition, eggs have been viewed as symbols of new life and fertility through the ages. It is believed that for this reason many ancient cultures, including the Ancient Egyptians, Persians, and Romans, used eggs during their spring festivals. Many traditions and practices have formed around Easter eggs. The coloring of eggs is a established art, and eggs are often dyed, painted, and otherwise decorated. Eggs were also used in various holiday games: parents would hide eggs for children to find, and children would roll eggs down hills. These practices live on in Easter egg hunts and egg rolls. The most famous egg roll takes place on the White House lawn every year. You can see that there is some discrepancy between accounts, but it is quite possible that Christians invested the practices of pagan rituals with new Christian meaning and kept some of the trappings. This reminds us, however, that we need to emphasize the correct meaning of Easter with our children and those who ask us what Easter is about. It is not wrong for us to celebrate the changing of season, but we would not want this associated with any God but the true one, and would not see our need to re-enact a pagan mythology in order to get God to bring spring about.